The Hepatitis C Virus (HCV) is the most common bloodborne infection in the U.S., and 45,000 Philadelphia residents are believed to have hepatitis C.
Members from Hepatitis C Allies of Philadelphia (HepCAP), an organization dedicated to raising awareness about Hepatitis C, and the city Department of Health were on hand for a HepCAP Town Hall Monday night at the South Philadelphia Library. 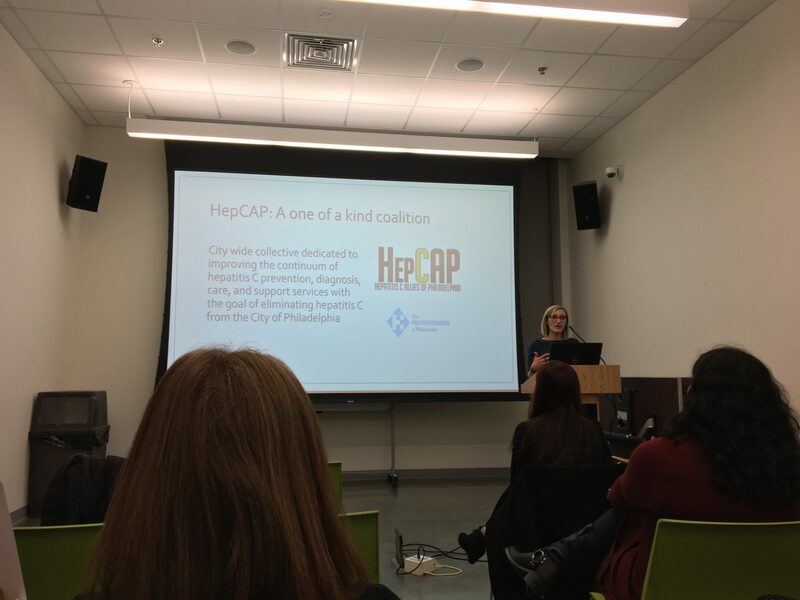 The event served as a gathering of local Hep C allies to exchange information and resources, identify neighborhood-specific strengths and opportunities, and empower and galvanize South Philadelphia communities to become leaders in the movement to eliminate hepatitis C in Philadelphia. The Hepatitis C Virus (HCV) is the most common bloodborne infection in the U.S., and 45,000 Philadelphia residents are believed to have hepatitis C. Over 50 percent of people living with a HCV are not even aware that they are infected, and many do not know there is a cure for HCV. According to Danica Kuncio, Viral Hepatitis program manager at the Department of Health, there are estimated to be at least 4.1 million people in the United States have HepC, a figure has gone up in recent years due to the opioid crisis. However, Kuncio said it’s likely the 4.1 million number is lower than the actual figure because people have to be tested for the disease in order to know if they actually have it. Unfortunately, Kuncio said, many people simply don’t get tested. The disease, however, is curable. If hepatitis C goes unchecked for decades, it can cause serious damage to the liver. The infection leads to inflammation, which leads to scarring. Cirrhosis, Trooskin said, puts you at risk for liver cancer and ultimately liver failure. Many people – 15 percent to 25 percent of people, to be exact, according to Trooskin – have the antibodies necessary to clear Hep C all on their own. According to Kuncio, there are nine states in the United States that account for more than half of the Hep C positive population, and Pennsylvania is one of them. Philadelphia, and even more specifically South Philly, in particular is a hotbed for those who are Hep C positive. Kuncio said that 1 in 39 Philadelphians has Hep C. The disease is even more common in South Philadelphia, where 1 in 29 people suffer from Hep C. In the 19145 ZIP code, the number is 1 in 25. Many speakers at the town hall spoke of harm reduction as a way to minimize the spread of HCV. An example of harm reduction could be encouraging people suffering from addiction to use drugs more safely rather than encouraging them to quit altogether. It’s the same way for those who suffer from substance abuse, Campanella explained. Since they’re going to use no matter what, they should at least be encouraged to use clean syringes, carry naloxone and to not use alone.